Ketogenic fat bombs are a simple way to get more fat into your macros. 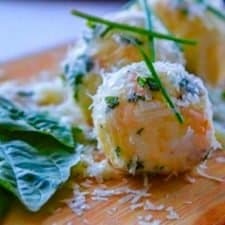 Small snacks or treats – high in fat & low in carbs – Keto Fat Bombs. 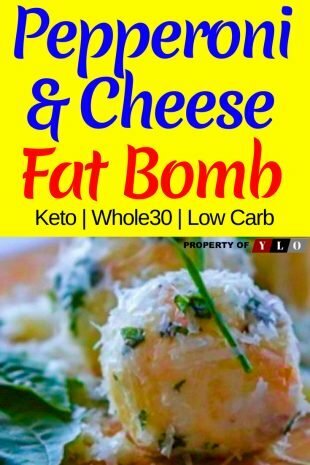 Everyone loves pizza, so today we are combining the flavors of pizza into some super easy to make and filling keto fat bombs – Pepperoni and Cheese. These super tasty morsels will almost melt in your mouth. They’re extremely easy to eat and they’re just plain delicious. Plus, they make for really cute appetizers if you’re serving them to multiple people. If you have these at a party just stick a slice of pepperoni underneath, stick a toothpick through the top, slide a basil leaf down and then add an olive slice on top for garnish. 1. Dice pepperoni. Cook at medium-low heat for 5-8 minutes. Remove from heat. Place on paper towel to soak up extra grease. 2. Mix together cream cheese, butter, cheddar cheese. 3. Add garlic. Fold in pepperoni. 4. Divide mixture into 6 equal parts. 5. Grate parmesan and chop basil, place into a separate bowl. 6. Place one fat bomb at a time in the bowl to coat it in the parmesan and basil. Pepperoni & Cheese Keto Fat Bombs make for really cute appetizers if you’re serving them to multiple people. If you have these at a party just stick a slice of pepperoni underneath, stick a toothpick through the top, slide a basil leaf down and then add an olive slice on top for garnish.